Hero Dogs Maggie has found her forever home! Maggie is a 2 ½ year old, 50 lb., spayed female yellow Labrador retriever. Maggie is a sweet, affectionate, high-energy little girl who loves people like crazy! There is nothing she wants more than to be in physical contact with her humans. However, Maggie has too much energy and not enough confidence to become a service dog. Maggie can be noise sensitive and worried in busy and chaotic environments. Maggie requires significant daily exercise. She needs a family with multiple people who are willing to both walk her and take her out to play ball several times a day. After being petted, playing ball is the thing that Maggie loves most in the world, so providing exercise to Maggie is actually very easy. Given adequate exercise, Maggie is capable of settling down indoors – but without enough exercise, you will both be miserable! 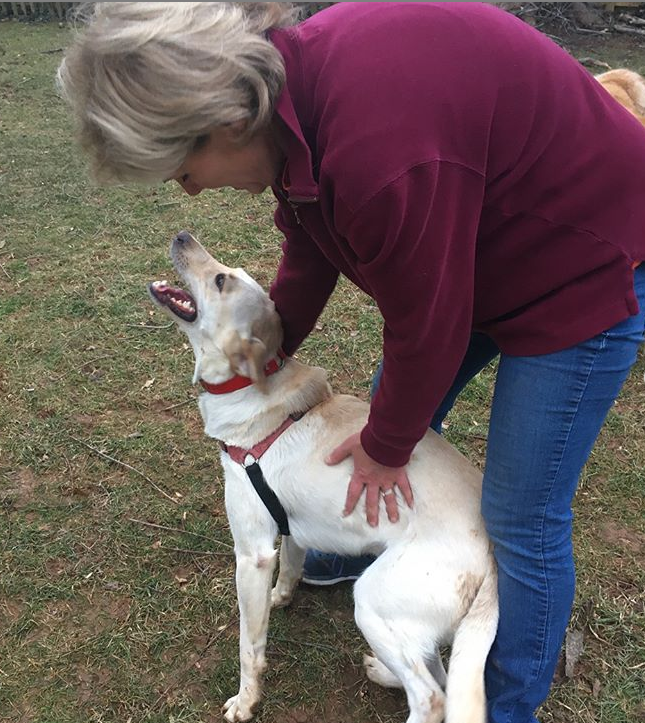 Although our foremost concern for Maggie is to find her a loving home which can meet her needs, priority will be given to a military, veteran, or first-responder family who is seeking a Skilled Home Companion, or to a person who is willing to pursue Therapy Dog work with Maggie. Maggie has basic skills that could aid a person with physical limitations. Her very physical and affectionate nature is also ideal for a person seeking emotional support. The adoption donation for Maggie is $1,000. Adoption donations are waived for veterans and first-responders. To apply to adopt Maggie, please click here. October has been another wonderful month of training and learning new things. New vocabulary words that i have been working on include: "pull, push, light, go-through, bring, hold, leave-it, place, step and come" just to name a few. I am able to pick up a quarter, penny, and a dime off of carpet. I have done a pretty good job at pressing handicapped buttons on doors and the cross-walk buttons. I have done an 'ok' job with turning the lights on and off. I did well on open steps. I attended a lunch meeting with my raisers boss and co-workers, I love those ladies! I also attended my last big meetings at my puppy raisers work place. I sit well through the meetings, and when its over, I like to see everyone. I get too excited to say a formal "hello", but I like to give hugs. My puppy raisers had a Hero Dogs outing in Frederick, I unfortunately, had to stay home. But they smelled like they had fun, and I smelled Claira, Stella, and some little puppies that I hadn't met yet. I enjoy spending special time with my baby guinea pigs. Actually, they are older than me, but I treat them as if they were my babies. Xo. I love Halloween, because I get to be.....Wonder Woman!! I fit the character well, because I am always ready for anything. The most important thing that I did in October was to go to The Pentagon. We took the MARC train into D.C. and then rode two metro trains to The Pentagon. It was a wonderful experience. I was able to show some of my skills of picking up items from the floor, such as keys, smart phone, and pens. I met a lot of very nice and important people who keep our Nation safe and secure. I was impressed by the people met and I think they were pretty impressed with the work we, Hero Dogs, are doing. It was a golden day in all of my days of training. October will end with the great puppy swap! Click here to read Maggie’s full blog.